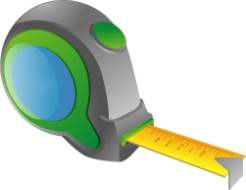 Compared with wood lumber, composite decking has a higher specific gravity and is much more heavy. Please be careful of transportation safety , and don’t try to handle WPC product in the same volume as wood lumber . When storing composite decking, be sure to place it on a flat surface. 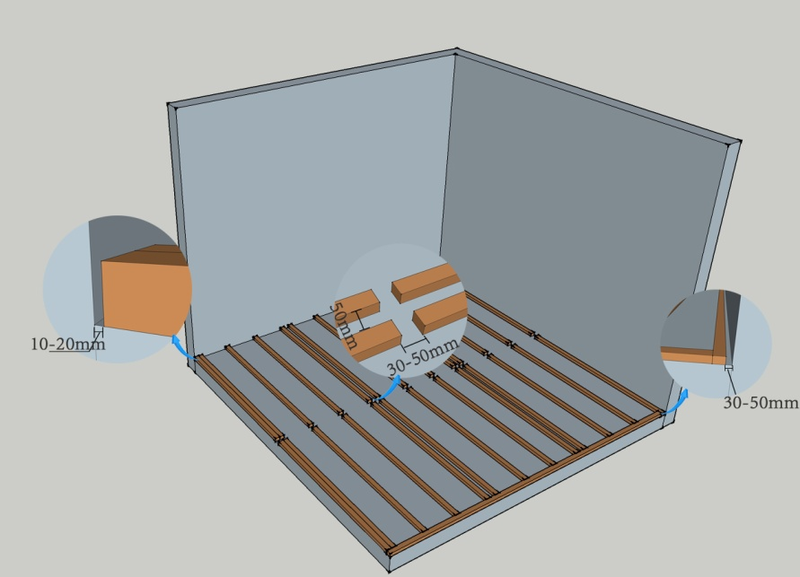 When stacking composite decking, should install composite decking beginning with the end of stow-wood, with a center-to-center span less than 500mm , and should lay the profiles on the stow-wood vertically. 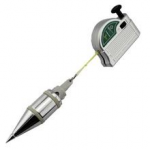 Use a posthole digger to dig holes for caissons. Pour concrete into the holes and smooth it with a float. Allow 24 hours for the concrete to cure. if the concrete ground is a sealed low-lying land, make sure there is at least one hole with diameter more than 10cm between two parallel joists every 2.5 meters , linking to the under mud ground to flow water and avoid water flood when it rains. If you are installing composite decking on the elevated platform, make sure the elevated framework using durable materials and structures, (such as metal or concrete material). 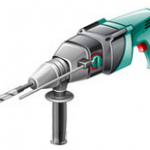 The screws used in the installation system must be of zinc or stainless steel material, and make sure that no rust. composite decking is not suitable to use as structural components for buildings. Don’t fix the composite decking directly on any solid surface or water-tight system, such as concrete, rooftop or balcony, etc. 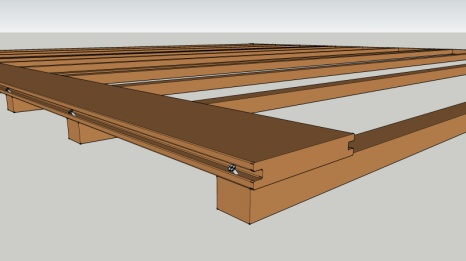 The joist must be fixed to the ground foundation firmly and ensure on the flat level, any kind of ground sinking , loose installation, or the joist not on the flat level, would cause warp or distortion of the decking boards after using in a period of time . If laid on the elevated structure, the joist must be fully secured to the frame, and no hanging at all. 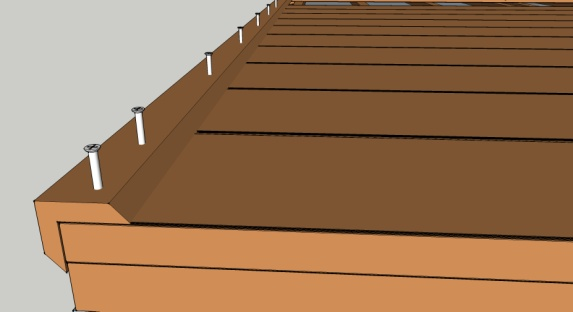 The joist direction is best to comply with the incline direction of elevated platform to drain water easily. Fix joist: the length of joist should not be too long, should be more than 3m; when fixing joist to foundation , you need to pre-drill holes firstly , then use an Impact drill to expand holes, and install the expansion screw at last. 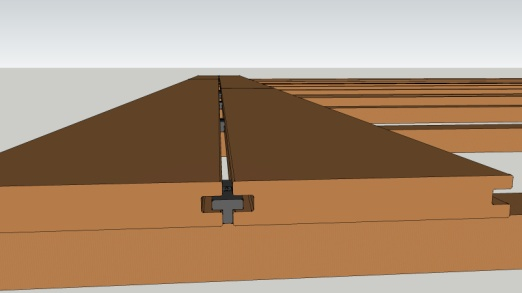 Distance from the expansion screw to the joist face should be more than5 cm, and space of expansion screw should be near 50 – 60 cm. Please refer to the “New Wave Flooring joist span chart”and “New wave flooring Angle Accommodation Chart” to choose the span. 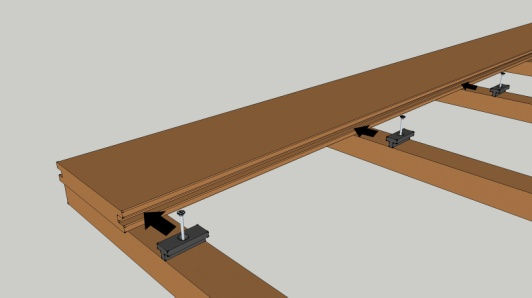 The Max span is not allowed to exceed 450mm.It may cause the decking bending down if the span it too big. 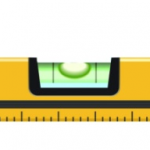 Width-to-Width: The general width-to width gapping is 2-5mm.the gapping inbetween decking by clip is determined by the clip size. End-to-end/end-to-width: new wave flooring end-to-end gaps based upon the decking length, the temperature at installation, the Coefficient of Thermal Expansion/Contraction and the highest temperature expected during the year. 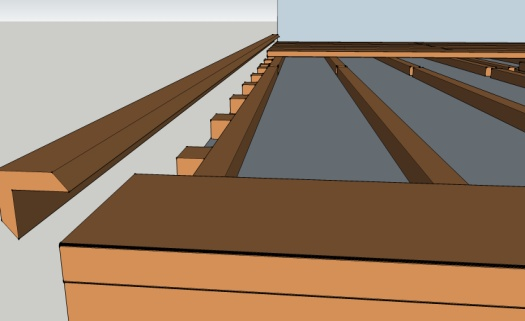 Double joists are very necessary at the place of crossing connection of decking. You need to install fasteners on both sides of the decking joints and we fixed on the 2 joists. 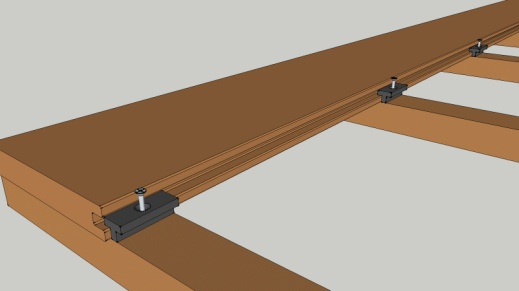 (which means at least 4 fasteners are necessary for decking joints)The span on side to side is 100mm. Install first board on start place, pre-drill pilot holes at an angle through grooved edge of deck board into joist. Install screws through pilot holes to secure. Important: you need to make sure the first board fixed and secured. 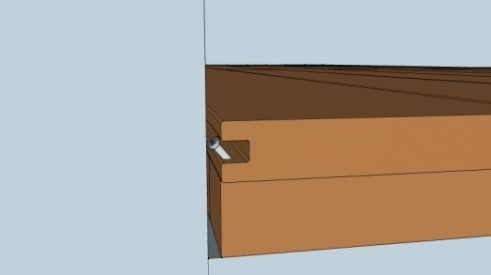 Insert fastener into grooved edge of deck board. 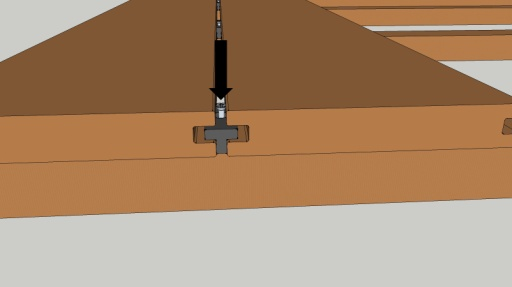 Align screw hole in fastener with center of joist. Continue same action along the length of the board at every joist. Note: For plastic clips, screw only halfway down. DO NOT fully tighten. For stainless steel clips, screw fully down. DO NOT fully tighten to prevent fastener deformation. Slide second board into place, making sure all fasteners fit into groove. At center of second board, toenail screw at an angle through grooved edge of deck board to secure deck and joist together. Install the next fastener on the other side of the second board in the same manner as Step 3 and 4. Note: If you use plastic clips, now tighten screws on fasteners in first row. Proceed with Steps 2 through 6 until installing last composite decking board. Pre-drill pilot holes at an angle through grooved edge of deck board into joist. Install screws through pilot holes to secure. Note: If you need to install cover board, pre-drill pilot holes at 45°angle or overhanging rim joist from below cover board or deck surface. Secure board with screws using pilot holes.